Kerber has lifted her first trophy since the 2016 U.S Open. Medvedev won his maiden crown on the ATP World Tour. 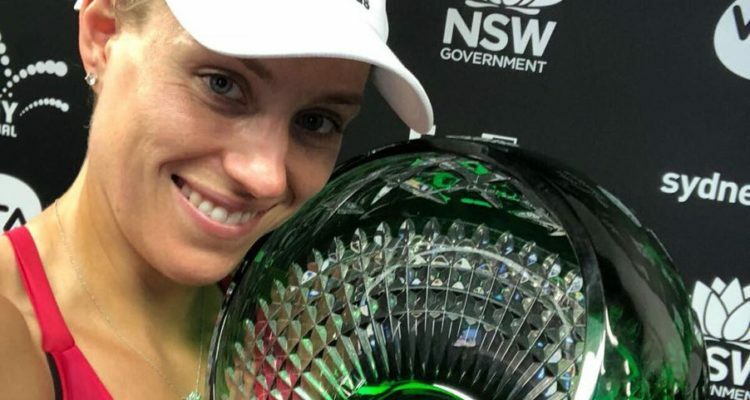 Two-time Grand Slam champion Angelique Kerber from Germany has claimed the women’s title at the Sydney International, beating Australian No.1 Ash Barty in straight sets, 6-4, 6-4. The victory delivers former world No.1 Kerber her first title since the 2016 U.S Open and cements her return to top form as she heads into next week’s Australian Open.
.@AngeliqueKerber claims the @SydneyTennis crown! “The draw was also not easy, I was not seeded, so, I was expecting from the beginning, to have really tough matches,” said Kerber. “I came here to just play match by match, and I was not looking too far ahead. I’m very proud how I was able to play every single day. In the men’s final, qualifier Daniil Medvedev of Russia proved too strong for wild card and hometown hero Alex De Minaur, beating him in a thrilling three set showdown 1-6, 6-4, 7-5. The victory makes Medvedev only the fourth qualifier to take out the Sydney International title since 2003. Lukasz Kubot and Marcelo Melo began 2018 much like they played throughout 2017, winning their first doubles title of the season after claiming six trophies last year. The Polish-Brazilian combination defeated Jan-Lennard Struff from Germany and Serbian Viktor Troicki 6-3, 6-4 on Friday afternoon. “Every level of the matches was, every time we played better and better, so that gives us a little bit confidence in the beginning of the year,” said Kubot. “It was great. I think we played very good in the final, as we have been playing in the tournament. We, for sure, are very happy to start the year with a title here in Sydney,” added Melo. This entry was posted in ATP Tour, ATP Tour News, WTA Tour News and tagged Angelique Kerber, ATP World Tour, Sydney International, WTA.